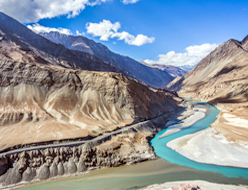 The desert type of climate is typical of Leh Ladakh with dry winds blowing throughout the day and summers being hot and humid. 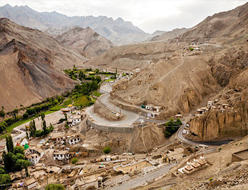 On your visit to Leh, you will face the cold desert climate, especially from October to March. In winters the temperatures are extreme in Leh, dipping below freezing point. However, winter days are sunny and bright. 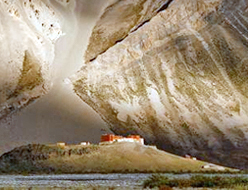 The lowest winter temperature recorded in Leh is around minus 23 degree Celsius. 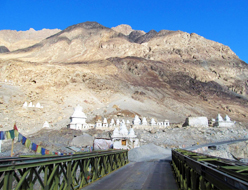 Mountaineers and trekkers enjoy the climate of Leh Ladakh to the fullest! Considering the extremities that you face here, make sure to carry winter shields, woolen wear and snow boots. Early morning Leave for Jispa, cross through Rohtang Pass (13050 ft) enter to Lahaul Valley, visit Raja Gyepan temple at Sissu Village, lunch at Keylong post lunch drive to Jispa. O/N Jispa. Early morning after breakfast leave for Leh, through by crossing Baralacha Pass (16020 ft) a beautiful drive on high altitude to be remembered for life time, Nakeela and Lachangla Pass 16,617 ft. Post Lunch drive to Leh passing through Skyangchu Thang (Plateau on Stretch of 42 Kms), Tanglang La Pass 17,585ft, 2nd highest motorable road in the world, reach upshi where your drive along with Indus river. O/N Leh. 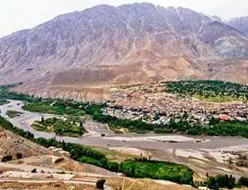 Leh – Sham region – Leh. After breakfast drive to Likir, Alchi Monastery, Pathar Sahib Gurudwara, Hall of Fame museum and Sangam (Confluence of Zanskar& Indus River). O/N Leh. After Breakfast drive to Nubra Valley via Khardungla (Highest Motorable road in the World, 18,380 ft) post lunch, enjoy the camel safari at Sand Dunes between Deskit&Hundur Village. O/N Nubra Valley. 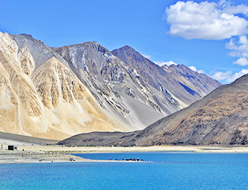 After Breakfast leave for Pangong Lake 14,500 ft, through Changla Pass 17,350 ft, 3rd Highest Motorable road in the world, Arrival at Camp, Later free time at Leisure and enjoy the color changing lake and the sun set on the banks of lake. O/N Pangong Lake. Early morning enjoy the picturesque view of Sun rise on lake. After Breakfast drive back to Leh, enroute visit Thikse Monastery and Shey Palace. O/N Leh. 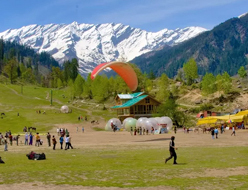 To reach the glaciers and the gondola station, you can hire ponies / horses on a direct payment basis as vehicles are not allowed beyond a certain point in Gulmarg and Sonmarg. The Gondola ride would be on direct payment basis. Rates are subject to change at the time of confirmation. 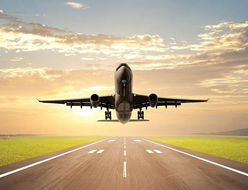 In order to proceed further with the reservation, we will need: Full Guest name, Age of Child (If Applicable), Flight details or Check-In time.